Mitt Romney is ahead by a single percentage point in Ohio - the swing state that many believe could decide the election, according to internal polling data provided to MailOnline by a Republican party source. Internal campaign polling completed last night by campaign pollster Neil Newhouse has Romney three points up in New Hampshire, two points up in Iowa and dead level in Wisconsin and - most startlingly - Pennsylvania. 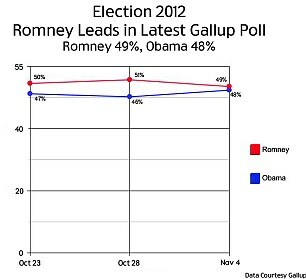 If the Romney campaign's internal numbers are correct - and nearly all independent pollsters have come up with a picture much more favourable for Obama - then the former Massachusetts governor will almost certainly be elected 45th U.S. President.